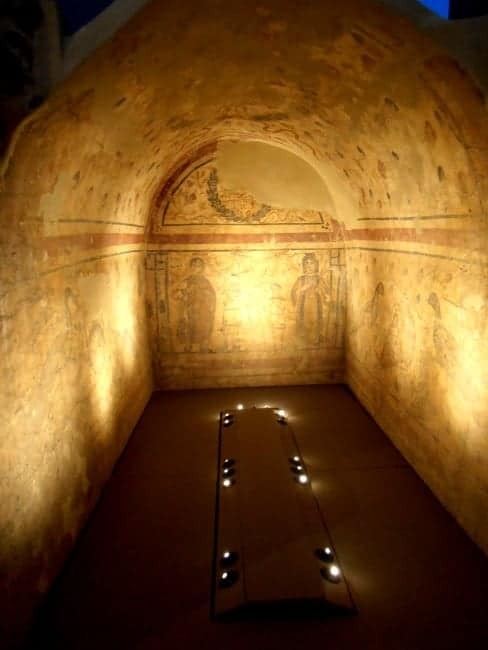 Interior of the 4th century AD Early Christian tomb of Aurilia Prokla in the Museum of Byzantine Culture at Thessaloniki. A small barrel-vaulted space, lavishly painted with scenes of plants, animals and humans: the interior of a vaulted tomb from the 4 th century AD. 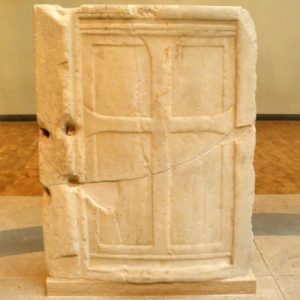 It is on display in the Museum of Byzantine Culture at Thessaloniki, where it forms part of an excellent section that showcases the early Christian cemeteries of the city and the funerary context of their time. Shown on its western wall is a family during the burial ceremony. The deceased herself, a lady of advanced age, is named by an inscription as “Aurilia Prokla, mother of all”; she is depicted on the northern wall. The family ritual takes place in an outdoor setting, perhaps some kind of courtyard or enclosure, the edges of which are defined on either side by the walls of a building or structure decorated with garlands and ribbons. Within it stand a couple, a man and woman in fine dress, with two boys between them holding a large jar (probably made of glass), and a small conical vessel, suitable for grave offerings. 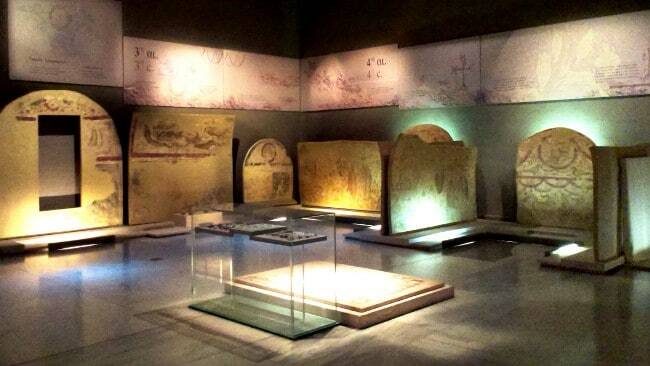 Part of the wonderful display of Early Christian graves in Thessaloniki’s Byzantine Museum. The tomb’s lateral walls are decorated with trees, plants, fruits, peacocks, ducks and other birds refreshing themselves by drinking from pottery vessels. They symbolise the souls of the deceased, shown in a paradisical landscape, expressing the serenity, beauty and happiness awaiting them in the afterlife. As a matter of fact, these motifs and the abstract idea of Paradise are frequently illustrated in the early Christian funerary repertoire, replete with allegoric, heavenly themes and ornamental motifs, as well as scenes from the Old and New Testament. In many ways, our Thessaloniki tomb is a reflection of very broad cultural contexts and developments. 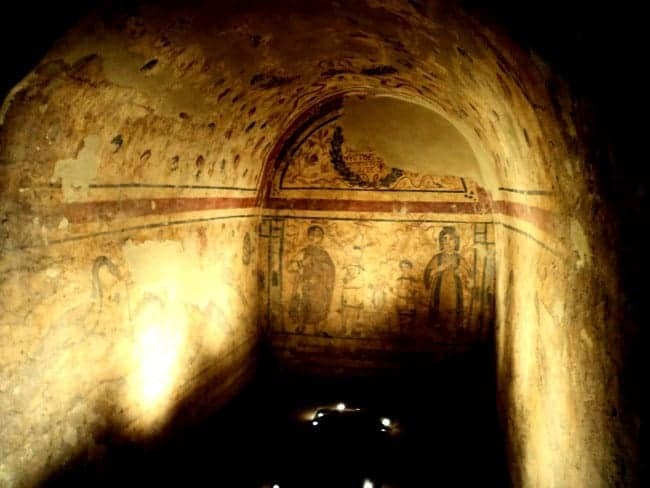 The concept of an afterlife and the performance of rituals in connection with burial are very ancient phenomena – in Greece they can be traced back to the prehistoric periods. At least since the Early Iron Age(1200-700 BC), common burial practice consisted of the prothesis (the laying out of the body), the ekphora (the funeral procession to the graveside, accompanied by lamentations and other expressions of mourning), followed by the cremation or inhumation of the body, accompanied by grave offerings. The final act of the burial ceremony was usually a funerary feast. 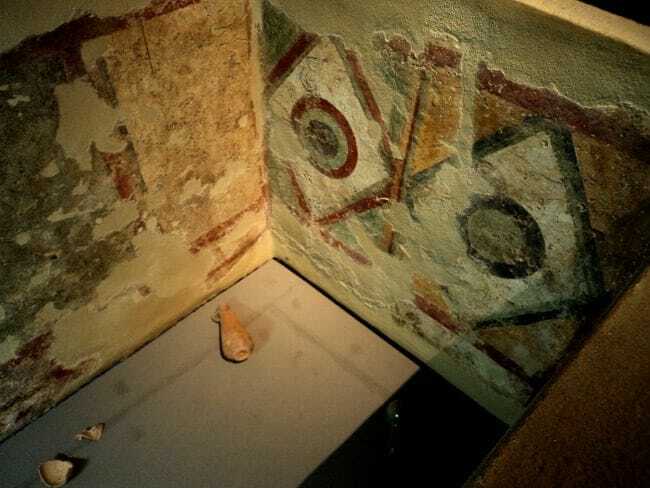 Detail from an other Early Christian tomb in Thessaloniki Museum, showing a fresco of geometric patterns, imitating an elaborate marble inlay. Dionysus: How will I get across? Heracles: In a little boat – just so big – an aged mariner will take you over, and take two obols for your fare. Dionysus: Bah. How powerful those two obols everywhere! How’d they get there? 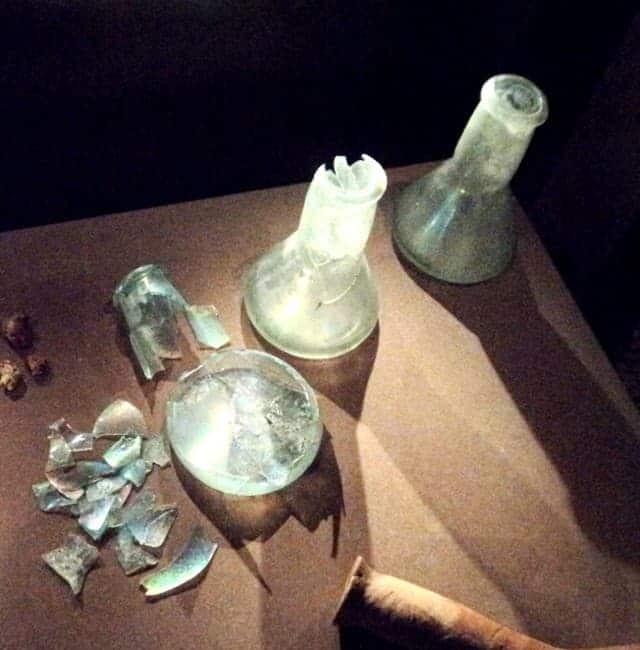 Glass vessels from Early Christian graves in the Thessaloniki museum. The Early Christian world was to formulate its own specific image of afterlife and Paradise, partially informed by those Classical traditions and partially by Hebrew scripture (the Old Testament), and laying greater emphasis on the positive aspect of death. The first Christians – dominated by their belief in the Resurrection of Christ and the prospect of the Last Judgment – appear to have maintained more or less the same Graeco-Roman burial rituals described above, with minor modifications such as the elimination of all forms of burial other than inhumation, due to religious prescriptions. Archaeological finds and tomb imagery indicate that the deceased (at least those belonging to the middle and upper classes) were still buried with their jewelry and dressed in their most luxurious clothing. 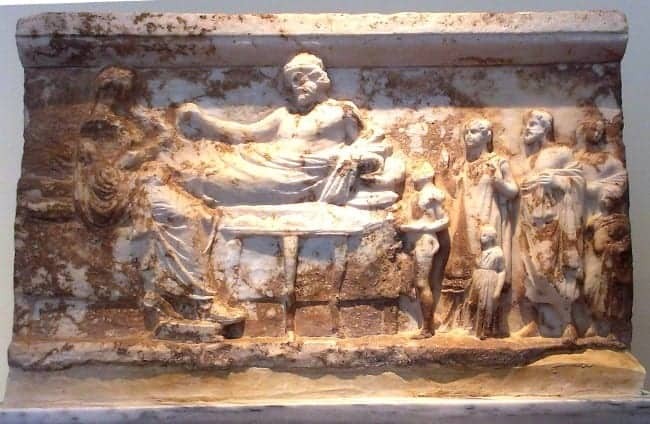 The corpse was washed and dressed by the relatives and then anointed with myra (aromatic oils and perfumes), followed by prothesis and ekphora. Grave offerings for the soul of the dead were placed in special glass and clay vessels deposited within the tomb. Late 4th century BC relief showing a funerary banquet. Athens: National Archaeological Museum. One of the most important events forming part of the funeral rites in ancient Greece was the so-called nekrodeipnon, the funerary banquet. The bereaved would offer libations (liquid offerings or choai) of wine or milk through a hole in the upper part of the grave, and then dine together in form of an official meal, often depicted on votive reliefs. In the new Christian context, banquets continuing this ancient tradition were still performed, now also drawing inspiration from the Last Supper; the last meal that Christ shared with his disciples in preparation for his imminent crucifixion. 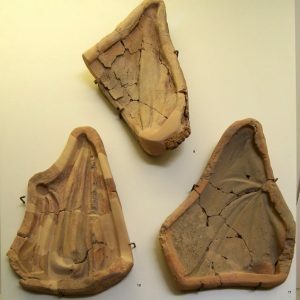 Archaeological remains from Early Christian cemeteries in Greece do indeed prove that funerary meals were prepared at regular periods, in a spirit of mourning and grieving, and often took place by the graveside itself.Tombs were often surrounded by built benches and platforms or pergolas decorated with plants and flowers were constructed atop graves. A special altar was also commonly placed in front of the tomb’s entrance in order to receive the grave offerings. Another view of the tomb of Aurilia Prokla. Thus, what is shown on the wall-painting of the Thessaloniki tomb reflects the reality of its time: a formal funerary ceremony of the 4th century AD, with members of the deceased’s family presenting liquid offerings by the grave. 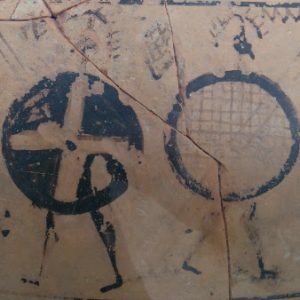 The scene is of a particular interest as it marks a fleeting moment of transition, when the habits of the ancient world met and overlapped with the beginnings of Christian tradition. The grave shown here was found in 1930 during excavations in the eastern part of Thessaloniki. 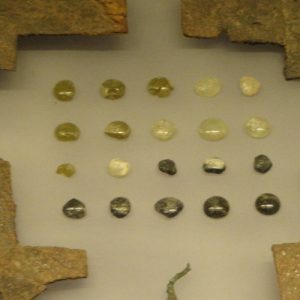 It is one of many astonishing finds shown in the city’s superb Museum of Byzantine Culture. You can see it, along with several others, on our From the Slopes Mt Olympus to the Shores of the Aegean: The Archeology, Food and Wine of Macedonia. Thessaloniki’s Byzantine riches are just one among many highlights on that tour; others include the outstanding treasures of the Macedonian Royal Tombs in the underground Museum of Vergina, the exquisite Archeological Museum of Pella, the great capital of the Macedonian kingdom and birthplace of Alexander the Great, and the vast Archaeological Museum of Thessaloniki.